Unionists have slammed the IT Bureau's fast-track scheme as they believe it will arouse more competition and adversely affect job opportunities of local talents. The bureau announced last week it would launch a three-year pilot scheme next month to speed up the import of IT talents in the fields of biotechology, artificial intelligence, internet security, robotics, data analysis, fintech and material science. Corporations that apply for the Technology Talent Admission Scheme would need to hire three local IT staff - a full-time worker and two interns - for every three talents imported. 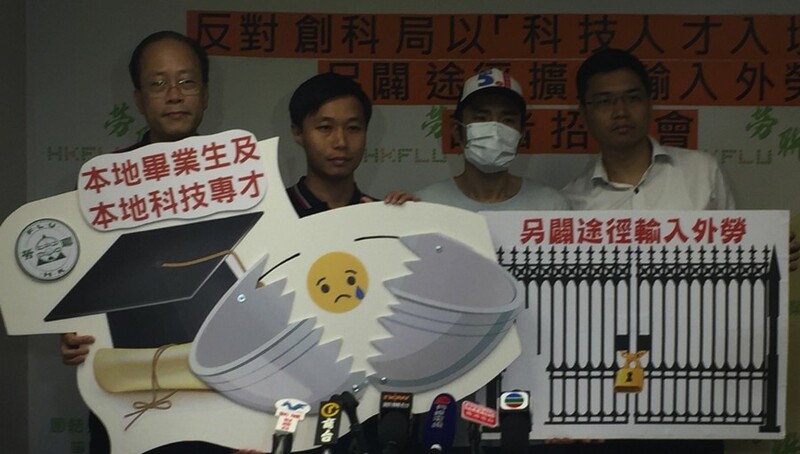 But the Federation of Hong Kong and Kowloon Labour Unions' chairman, Lam Chun-sing, said the scheme has a low requirement for imported labor as it targets bachelor IT degree holders with a year of experience and master IT degree holders with no experience. He said the threshold of the scheme is too simple to fulfill and is concerned that the imported labor will threaten opportunities for local graduates. The federation said there are about 20,000 people from the IT, engineering and science fields that graduated between 2016 and 2017. It added that it can only support local IT development without the importation of foreign labor. "Will the imported labor be experts and experienced workers in the field? Can local fresh graduates do the same job?" Lam said. An IT worker, surnamed Chan, who graduated last year, said he competed with nine people for his current job as a biotechnology researcher at the Science Park. He said there is fierce competition for positions requiring less experience. Even though the pilot scheme requires companies to hire local interns, Chan feels it will not be beneficial for students. Internships, he added, usually have no relevance to their field of study, recalling that he did mere administrative and miscellaneous tasks during his internship. General-secretary Chau Siu-chung questioned the need to establish a separate scheme for the import of IT talents. He said the bureau could just use the Immigration Department's General Employment Policy and the Admission Scheme for Mainland Talents and Professionals, adding that over 5,200 and 2,700 IT experts have come to the SAR through the two schemes. Chau suspects the government wants to extend the scheme to other industries in the future. Financial Secretary Paul Chan Mo-po said by attracting more overseas enterprises to Hong Kong, there will be an increase in job opportunities for locals. On his blog yesterday, he said Hong Kong should groom local talents and lure their foreign counterparts and corporations to the city. He believes that implementing the scheme will establish a healthy atmosphere in the IT industry.